ViSP allows to introduce trace and debug printings that may help debugging. To this end ViSP provides C or C++ macros that allows to print messages to the standard output std::cout or to std::cerr. The following table summarizes the macro defined in visp3/code/vpDebug.h header. Macro for tracing vpTRACE(), vpTRACE(level), vpERROR_TRACE(), vpERROR_TRACE(level), vpIN_FCT() and vpOUT_FCT() work like printf with carrier return at the end of the string, while vpCTRACE() and vpCERROR() work like the C++ output streams std::cout and std::cerr. All these macro print messages only if VP_TRACE macro is defined. Macro that has level as parameter like vpTRACE(level) or vpERROR_TRACE(level) use an additional define named VP_DEBUG_MODE. They print only messages if VP_DEBUG_MODE >= level. Macros for debug vpDEBUG_TRACE(), vpDEBUG_TRACE(level), vpDERROR_TRACE() and vpDERROR_TRACE(level) work like printf while vpCDEBUG(level) works like the C++ output stream std::cout. These macro print messages only if VP_DEBUG macro is defined. Macro that has level as parameter like vpDEBUG_TRACE(level) or vpDERROR_TRACE(level) use an additional define named VP_DEBUG_MODE. They print only messages if VP_DEBUG_MODE >= level. 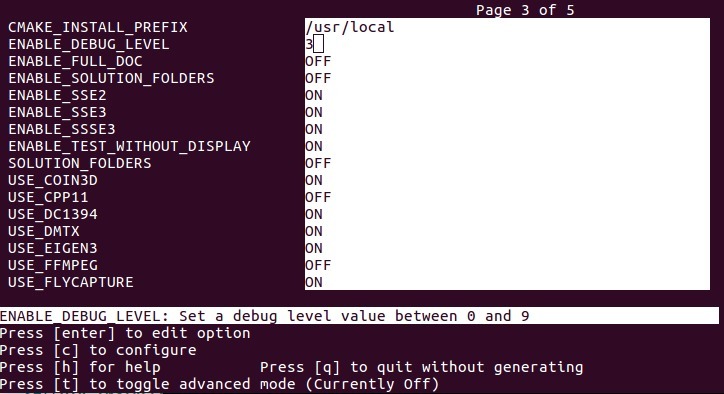 Moreover vpDEBUG_ENABLE(level) can be used to check if a given debug level is active; vpDEBUG_ENABLE(level) is equal to 1 if VP_DEBUG_MODE >= level, otherwise vpDEBUG_ENABLE(level) is equal to 0. In ViSP, before an exception is thrown, trace macro are widely used to inform the user that an error occur. This is redundant, since the same trace message in generally associated to the exception that is thrown. Since ViSP 3.1.0, during CMake configuration it is possible to tune debug and trace printings by setting ENABLE_DEBUG_LEVEL cmake variable. When ENABLE_DEBUG_LEVEL is set to 0 (this is the default behavior in ViSP), we don't define VP_TRACE and VP_DEBUG macro. If you develop a project that uses ViSP library as a 3rd party, there are different ways to benefit from debug and trace macro described previously. If ViSP was build with debug and trace enabled using cmake ENABLE_DEBUG_LEVEL=<level>, debug and trace are also enabled in your development. The following example also available in tutorial-trace.cpp shows how to use the previous macro. the number after "L" indicates the debug or trace level; example (L2) is for level 2.
the number after "#" indicates the line of the code that produce the printing; example main(#37) means in function main() at line 37.
the "!!" indicate that the printing is on std::cerr. Others are on std::cout.